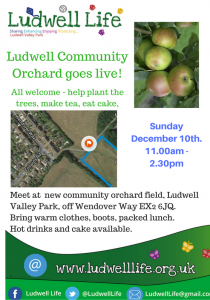 On Sunday December 10th, 11.00am – 2.30pm, come and join the official opening day for Ludwell’s new community orchard. All welcome, whether you can help with tree planting or putting up tree guards, making tea or just cheering the whole thing on. Anyone bringing cake / biscuits will be very welcome, as we are offering tea and cake for volunteers and supporters.